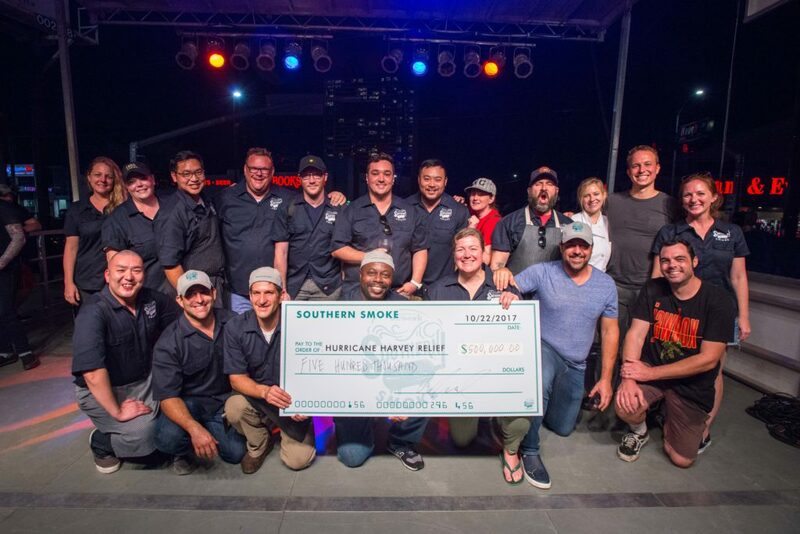 The 2018 Southern Smoke festival is taking place on September 30 and features nine chefs from across the country who represent some of the nation’s best restaurants. Chef and owner Chris Shepherd of One Fifth, UB Preserv and the forthcoming Georgia James, created the festival in 2015 after learning his friend, sommelier Antonio Gianola of Houston Wine Merchant, was diagnosed with multiple sclerosis. Southern Smoke has raised over $454,000 to date for the Multiple Sclerosis (MS) Society. In fact, it’s the largest third-party fundraiser for the MS Society in the region. The festivities are stretching across three locations just off of Westheimer and Montrose: Blacksmith Coffee at 1018 Westheimer; The Hay Merchant at 1100 Westheimer; and Legacy Community Health at 1415 California. General Admission tickets are $200 and VIP tickets are $350. (All of the Super VIP tickets have already sold out.) Tickets can be purchased online and those unable to attend can also make donations. VIP tickets allow for early admission at 3 p.m. while general admission starts at 4 p.m.
Last year after Hurricane Harvey, Southern Smoke shifted focus to raise money for food and beverage industry workers who were affected by the hurricane. The effort raised over half a million dollars and helped 139 people. A representative for Southern Smoke says the organization has since donated $1,002,250 —both directly to the people who applied for aid, as well as to charitable organizations that also helped people in the food and beverage industry. 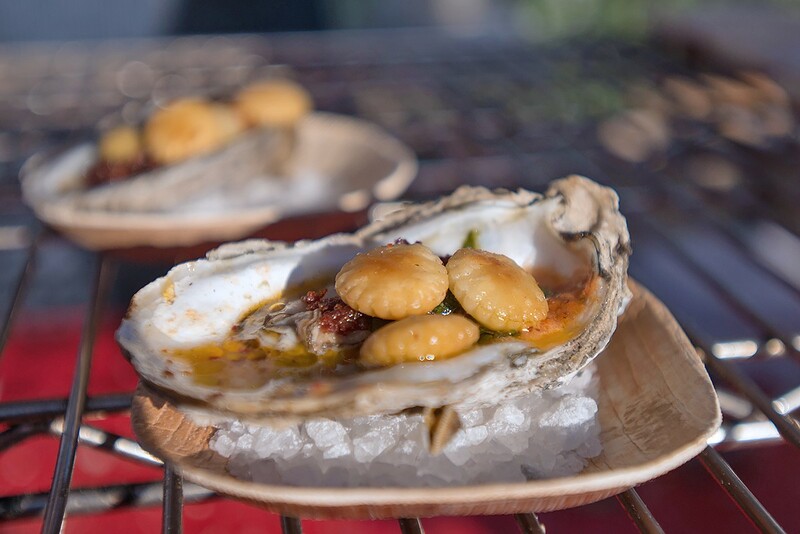 Oysters prepared by chef Ashley Christensen for Southern Smoke 2017. Photo by Catchlight Photography. For the 2018 festival, proceeds are again being directed to the MS Society with a fundraising goal of $300,000. Additionally, as a result of last year’s Hurricane Harvey relief efforts, the Southern Smoke Foundation has expanded to include an ongoing emergency relief fund for people in the food and beverage industry. 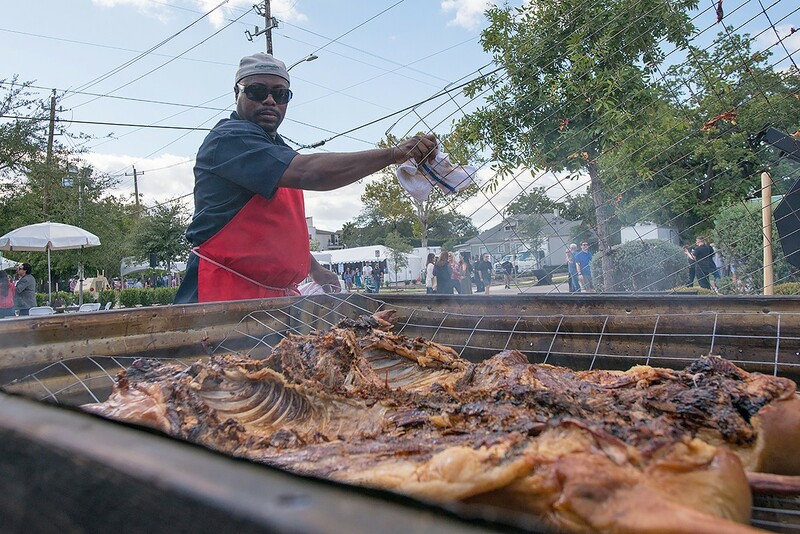 Chef Rodney Scott checks on his roasted pig during Southern Smoke 2017. Photo by Catchlight Photography. Participating Houston chefs include these James Beard Award-winning chefs: the aforementioned Chris Shepherd; Justin Yu of Theodore Rex and Better Luck Tomorrow; and Hugo Ortega of H-Town Restaurant Group, which includes Xochi, Caracol and Hugo’s. Also participating are James Beard Award-nominated Ryan Pera of Coltivare and Revival Market; Manabu Horiuchi of Kata Robata; and Terrence Gallivan and Seth Siegel-Gardner of The Pass & Provisions. Other notable chefs include culinary director Brandi Key of Lasco Enterprises (which owns Max’s Wine Dive and The Tasting Room); Erin Smith and Patrick Feges of Feges BBQ; and Lyle Bento of Underbelly Hospitality. In past years, lines have been long but there’s been no shortage of food — and definitely no shortage of wine. Ticket holders might make sure to attend with an appetite and a dose of patience in tow.